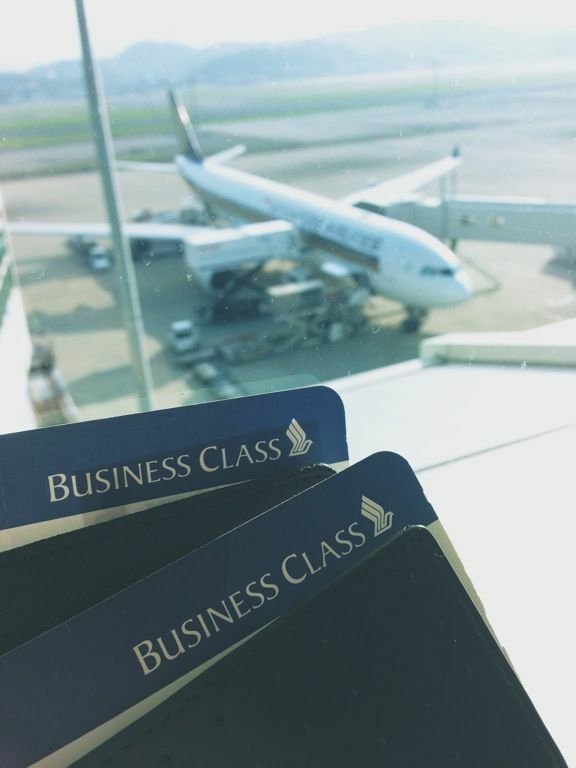 Kickstarting the trip report on my autumn Japan Kyushu trip starting with the flight experience from Singapore to Fukuoka on the Singapore Airlines A330-300 Business Class. My SQ business class experience has been limited to the long haul flights so i was pretty interested in finding out what's the difference on this medium haul flight. 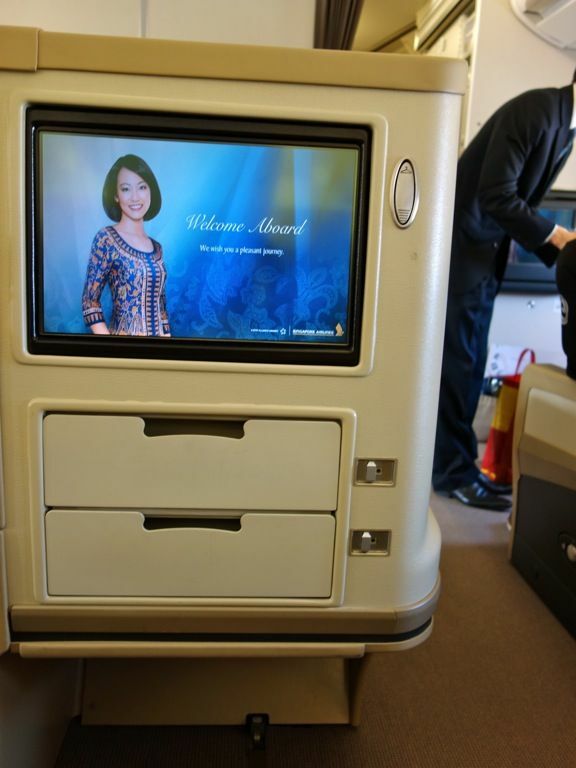 The medium-haul Singapore Airlines Business Class to Fukuoka on A330-300 is configured in a 2-2-2 layout with 30 Business Class and 255 Economy Class seats. The configuration is certainly not as comfortable as the 1-2-1 on the A380 (read my review here) but the space is adequate. An advanced seat control panel allows you to adjust your seating. The seat converts to an 8 degree incline lie-flat bed but i'm not a fan of this as i kept sliding down my seat due to my petite stature. Each seat also has a fixed back shell that offers enhanced privacy and there is also a personal screen between the seats. The seats are upholstered in premium leather and ergonomically designed but the general cabin space has a lot of plastic and the finishing wasn't quite flawless. My first thought was that this was an old plane and the interior was refurbished some time ago. I wasn't quite sure why there are strange pockets of stowage areas. They weren't very useful in terms of storing laptops or oddly shaped items. In terms of power, I was grateful for the in seat laptop supply to keep me juiced before we land. Again, SQ doesn't provide personal amenity kits for J class. 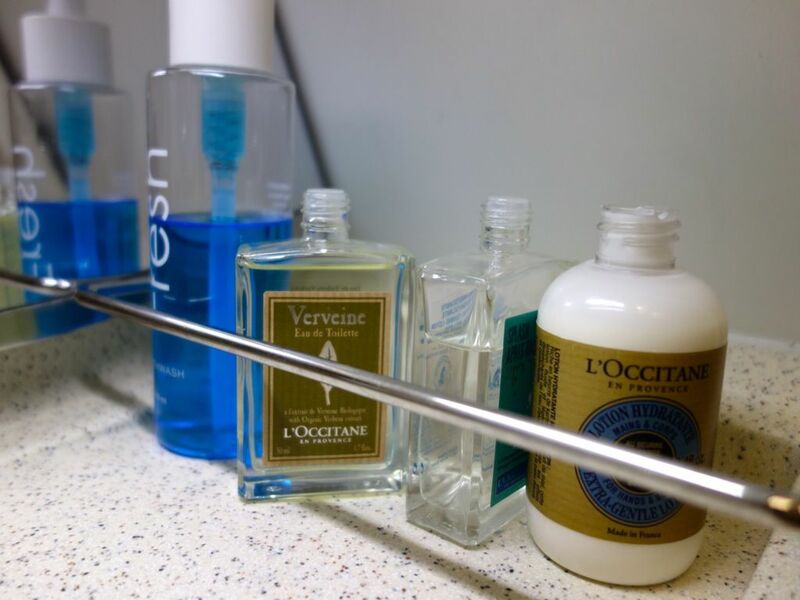 L'Occitane toiletries are provided in the bathroom. BLEARGH. Since we took the red eye to Fukuoka, supper was offered on the sleeper service menu. We used the Book the Cook (BTC) service to pre-order our main course, which i immediately regretted when i saw the in-flight menu. The pecking order of SQ airline food is as such: First the fabulous Hananakorireki (a delectable Japanese meal created based on the seasons). 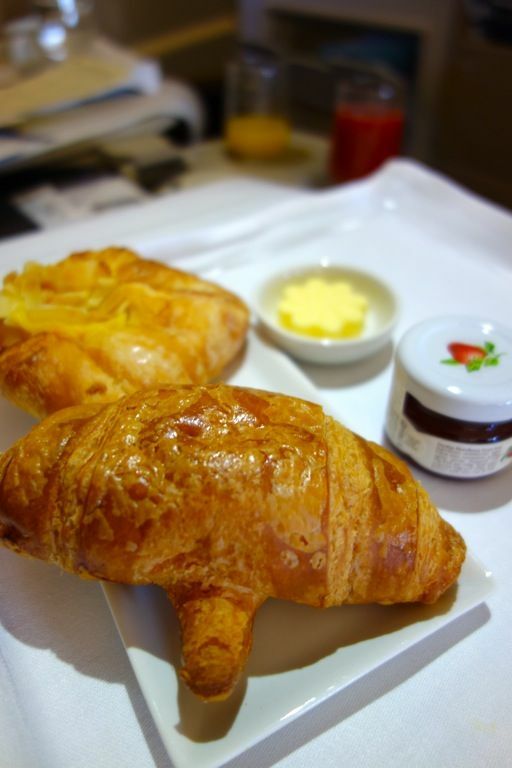 Next the BTC and last the regular 3 course meal provided on the plane. Tip: Never bother with BTC when flying to/from Japan (especially from Japan). Trust me, nothing on the menu is as good as the Japanese meal prepared. I wouldn't even bother with the International and Asian cuisine in the regular meal. Started with some meh pastries, which were made better with butter that i personally salted. The Boston Lobster Thermidor is a hot favorite on the BTC menu. I would certainly recommend this. 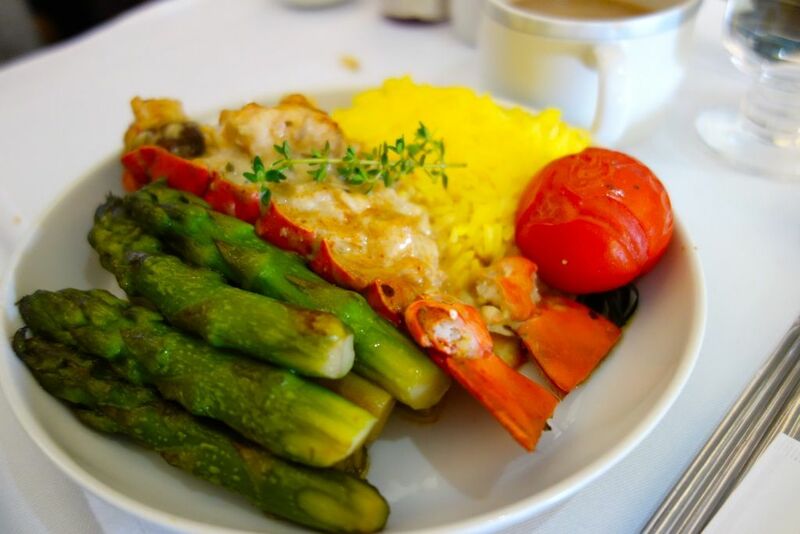 Succulent Lobster tail sautéed in butter, flambéed in brandy, sprinkled with cheese, and served with creamy mushroom sauce, garlic and spicy mustard, and buttered asparagus. Quite delightful. 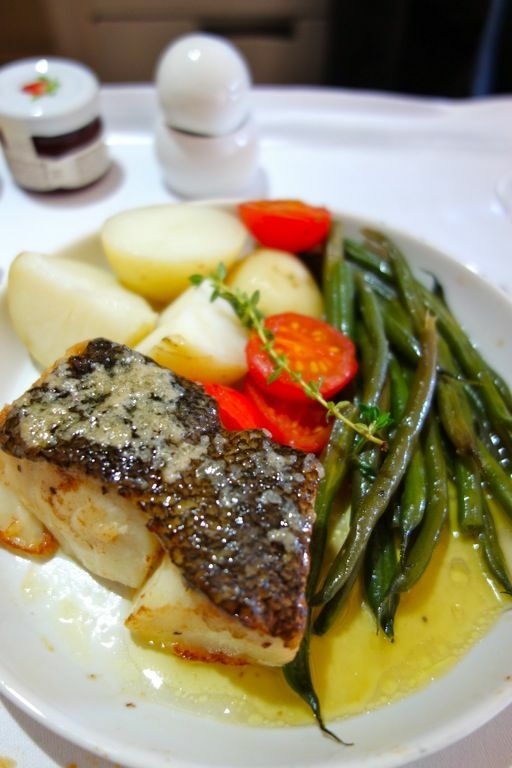 S had been raving about the Seared Black Cod Fillet 'à la Niçoise' for some time now and so he booked that for me. Served with haricot vert, olives, kalamata olives, cherry tomato and anchovy butter. I wasn't quite impressed. It's the first time i had fishy cod (and i don't mean that in a good way). :( I would very much have preferred the Seared Nut-Crusted Veal Fillet by Chef Carlo Cracco, Seared Lamb Loin by Chef Matthew Moran or the Confit of Chicken with Mushroom Risotto on the BTC menu. I'm obviously the meat girl. So on the flight back from Fukuoka, we did not book the cook! Of course i had to have my Japanese meal. Our prelude to the flight was the satay with peanut sauce! It's quite nicely done actually. Meat was a little dry but the rich peanut sauce made up for it. So here is the Autumn Hanakorireki. I was under the impression that i had to pick 1 set out of the 2 set list but they actually serve 2 bento sets per passenger. Woah. Prawn and chrysanthemum in beancurd paste; Gizzard shad with seaweed in sweetened vinegar; Prawn and trout roe rolled in radish; Red pimento in sweetened vinegar; Cold udon noodles; Scallop and vegetable omelette. Bentos rock my socks! Grilled scallop with egg yolk, simmered abalone and yam, Sea bream sushi, fried chicken and asparagus in a rice roll; Simmered tender pork cubes with grated potatoes, winter melon, green beans and carrot; Simmered duck with black pepper, scallop and wakame with jelly, roasted chestnut, dried wheat gluten, simmered shellfish on pickled mustard leaf; Vinegared rice topped with conger eel and crab meat; Salmon with salted rice malt, turnip in sweet vinegar. Other than the salmon being a little overdone, the rest of the dishes were all flavorful and delicious. I'm a huge fan of variety so the meal was quite faultless. You'll always be able to find something yummeh in a bento with so many items! We ended the meal with all my favorite autumn products in 1 dessert! Azuki mousse and sweet potato cream matcha cake! The sponge may be a little dry but the mousse and cream made up for it. Then came the fruits! HUGE and FRESH produce of Fukuoka. The stewardess insisted that we take some to taste! Absolutely juicy and sweet pear and persimmon. We actually bought some before we left Fukuoka and when we regretted not buying more after we tried these on the plane.